My name is Lori Aguilar. I have two sons and the three of us moved to Keller about a year and half ago. 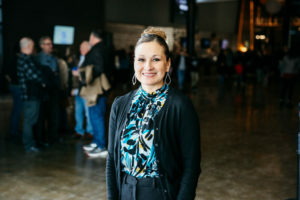 I had never fully surrendered my life to Christ…we moved, things got busy, and I became disconnected in so many ways. I started to become someone that I truly wasn’t and I realized that the happy, fun, silly, party person that I thought I was—in reality—was not happy at all. I had learned to cope with my insecurities by pretending to be someone I was not. In October 2017, I was invited to visit Milestone by my neighbor, Michaela Sims. My two sons and I met her and her sweet family at a service but what I didn’t realize at that time is that God was preparing me for something big. On January 21 of this year I went to church, and Pastor Jeff shared a message about the Potter and the clay. It was so clear and I felt like God was speaking directly to me. I surrendered my life to Him during that service and one week later I was baptized! The old Lori died and a new Lori was born. This is who He made me to be. I now feel a peace and calmness that I’ve never felt before. I have a wonderful small group that is holding my hand through this journey and I also lead a small group at work during lunch on Fridays! I’m taking steps, but I know in my heart that this is who he made me to be. I am embracing these relationships and this is just the beginning of a beautiful journey with the Lord. Wow! Lori, thank you for sharing your story! 2018 is going to be your best year yet! Lori! You are so precious! I love to see what God is doing in your life and in your heart to share Him with others. This is just the beginning is right. So proud of you Lori. What an amazing story! So stoked for you, Lori. Keep walking out your new identity. Thank you for telling your story Lori! The journey is just beginning and our Lord has you in His arms. So excited for you! Lori I’m so happy for you. Your a very sweet beautiful lady. And little beautiful family. May God to continue to bless you and your sweet boys ? Lori I’m so happy for you. Your a very sweet beautiful lady. And you have a little beautiful family. May God to continue to bless you and your sweet boys ? Lori l m happy that you are now a new creature in the Lord.